For malignant intramucosal or slightly submucosa-invasive early neoplasias of the squamous epithelium in the esophagus and hypopharynx, endoscopic en bloc resection with free margins results in near 100% rate of cure. When the carcinoma is deeply invasive (>200 μm) into the submucosa, the risk of nodal metastasis is too high and resective surgery is indicated. The decision between endoscopic resection and surgical esophagectomy rests on accurate endoscopic diagnosis; biopsy (only one or two) must be targeted to avoid extensive scarring before endoscopic submucosal dissection (ESD). 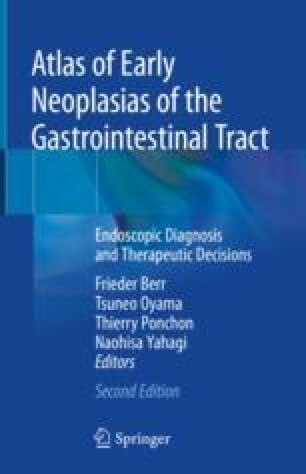 The aim of this chapter is to improve the detection of small and even minute mucosal premalignant or malignant neoplasias, as well as the endoscopic assessment of the lateral extension of the neoplasia and probability and grade of its submucosal invasion. We acknowledge the contribution of cases by Dr. Hans-Peter Allgaier, Freiburg, Germany; Dr. Gerhard Kleber, Aalen, Germany; and Dr. Daniel Neureiter and Dr. Frieder Berr, Salzburg, Austria.